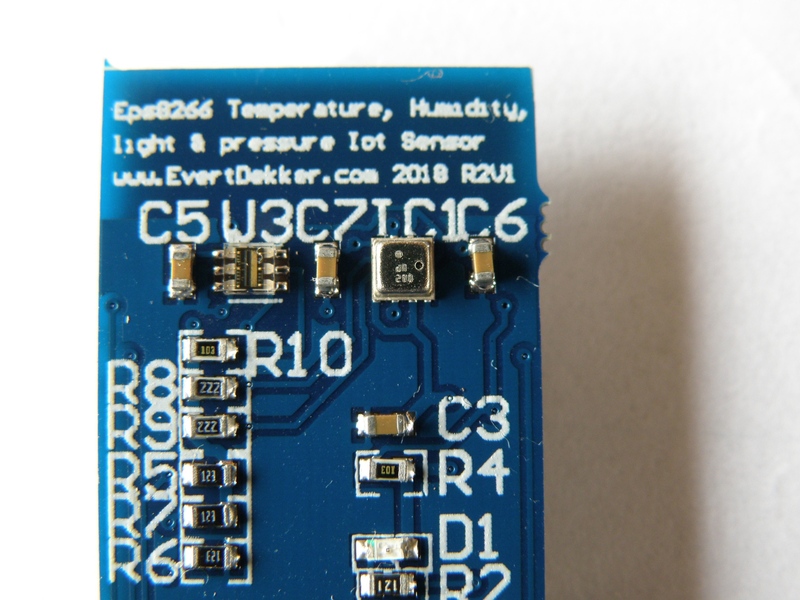 Iot Esp8266 temperature, humidity, atmospheric pressure and light sensor. After the problems with my sensor based on the DHT22 time for a redesign, this time with the BME280 for measuring temperature, humidity and atmospheric pressure. The TSL2561 known from my light sensor node is used for measuring light level. Note: it’s hard to solder the TSL2561 and it’s even harder to solder the BME280, think it over before starting on it if you want to make your own copy. My first 4 attempts soldering the BME280 failed. 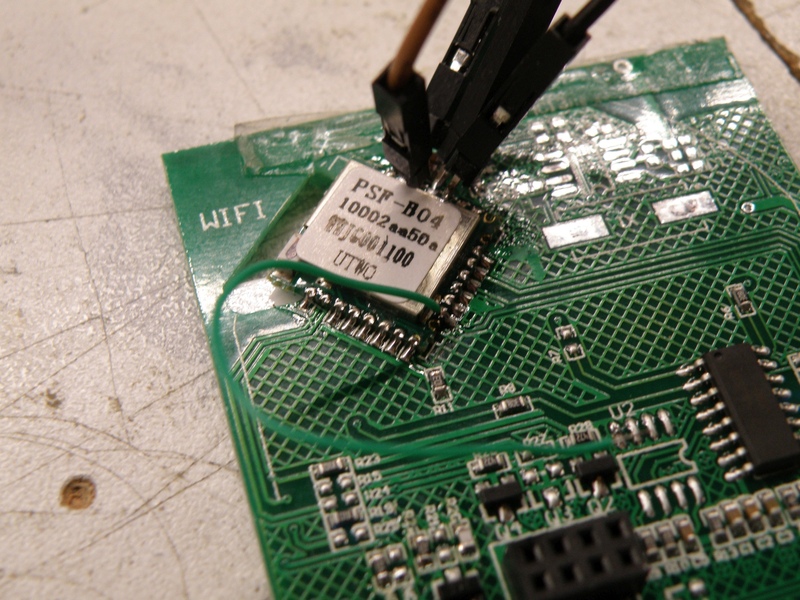 With a chip this small and the small pads that are needed for it, it’s important that to all the pads there’s an equal amount of solder paste applied. If that’s not the case the whole chip rest on the pads with the most solder and will not make contact with the other pads, extra handicap is in this case that the BME280 has a metal case an will make very easy a short circuit if you use to much solder. 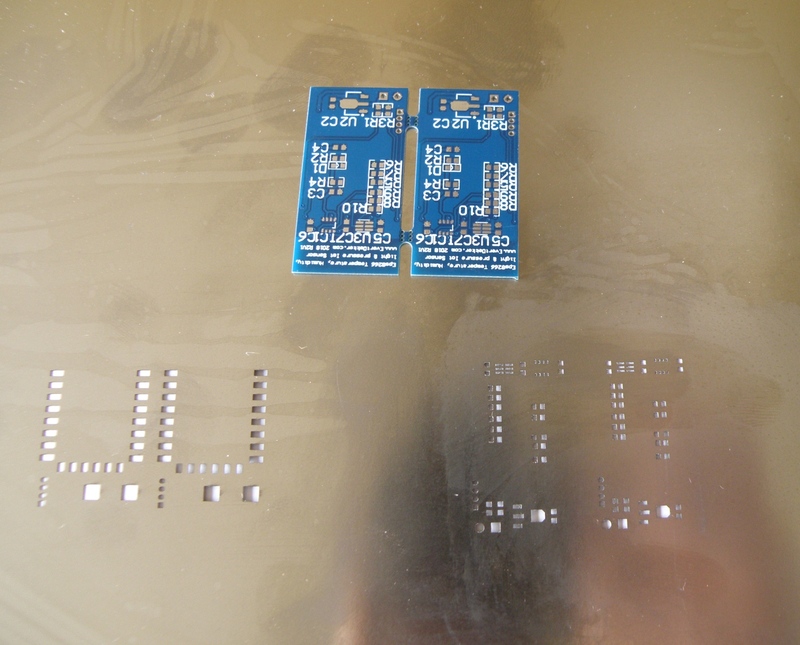 I have ordered now a stencil to apply the solder paste even on the pcb. To be continued…. Stencil is finally in. Due the Chinese new year it took some time before they produced and shipped it. 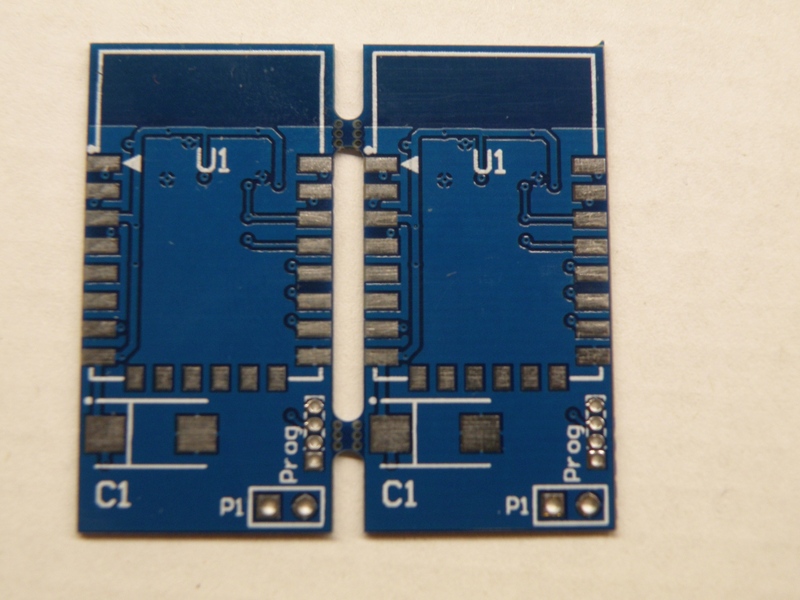 I have ordered it from Jlcpcb and it costs only $9 including shipping, unbelievable cheap. 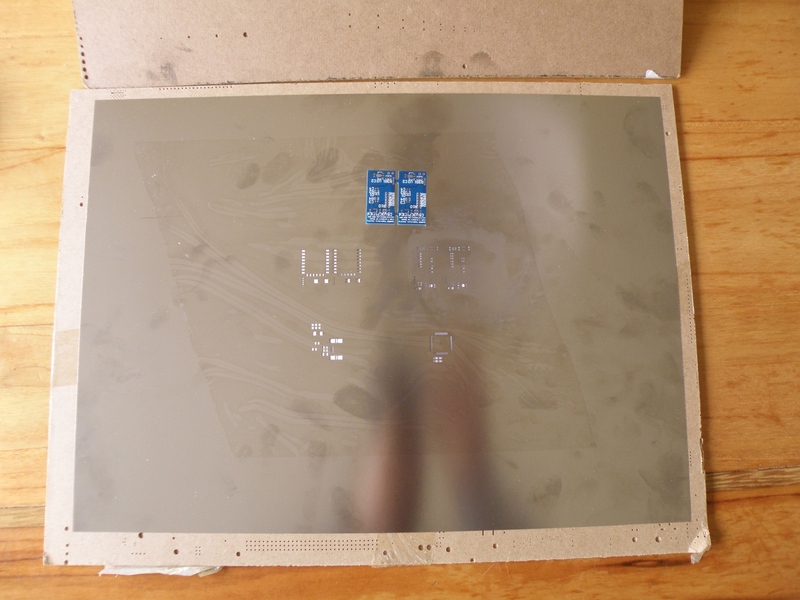 That’s a huge stencil for such a small pcb, it didn’t even fit in the mailbox and had to collect it from the post office. Stencil is for 2 different project’s, the upper 2 are for this project. The stencil I ordered was 100µm thick, not a standard thickness they sell, but ask for it and you will get it. Components with that small pads as the BM280 requires not to much paste, that’s why I prefer 100µm for those kind of components. 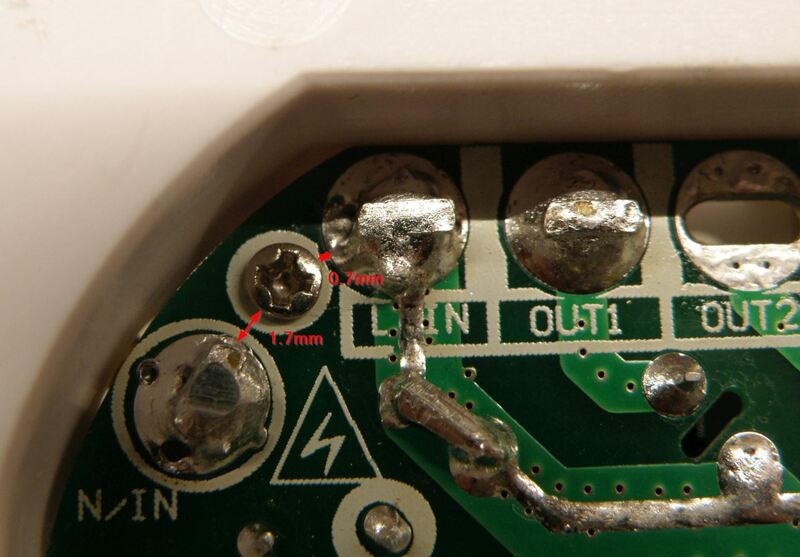 With the stencil is was easy to apply the solder paste and with the heat gun is was all soldered with ease. 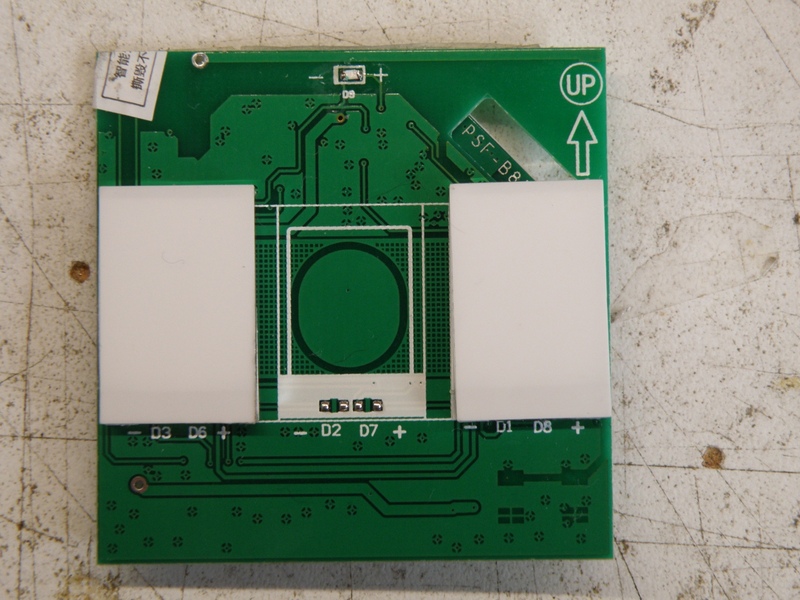 Have a look at my making of the Colinkex jtag to get an idea how to apply the paste simple with not to much effort at home. After testing every works very well. Temperature, humidity, atmospheric pressure and lux are send with the help of MQTT to the SQlite database and Node-red ones in the 2 minutes. Some fine tuning in the with Arduino created software to disable the BME280 and TSL2561 just before the ESP8266 goes in deep sleep to reduce the standby power. 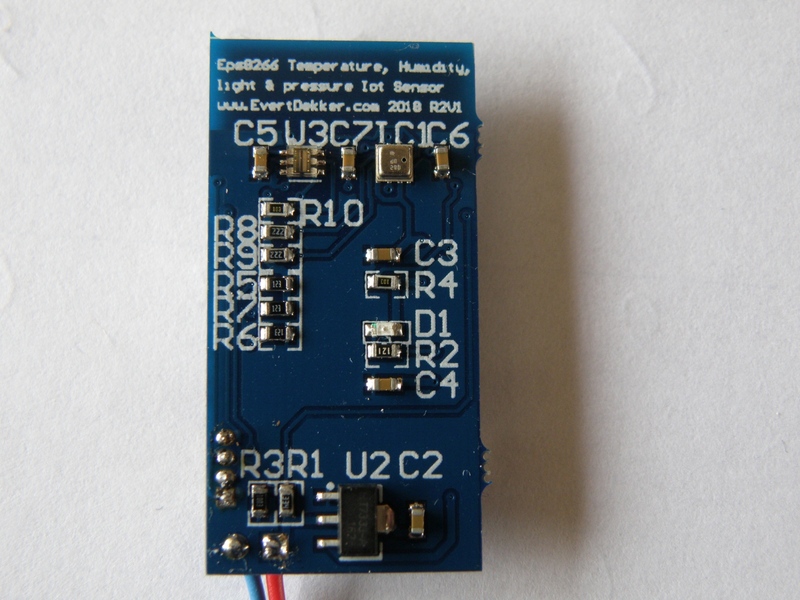 Standby current is now 42µA, more then the sensor with the DHT22 (27µA) but good enough. 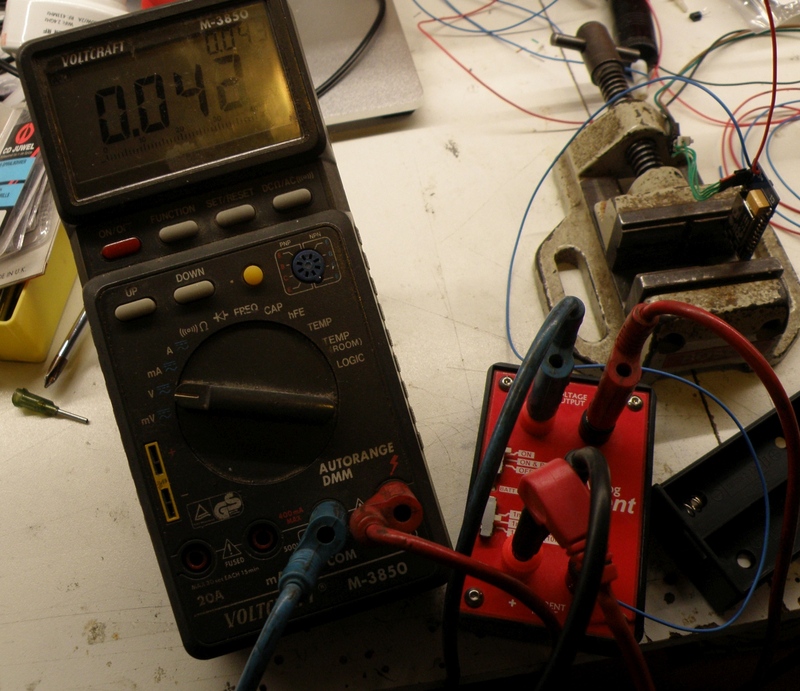 Btw, to measure the standby current that precise I used the µcurrent designed by Dave Jones from EEVblog. You want to make your own, download the Altium Designer 16 files. 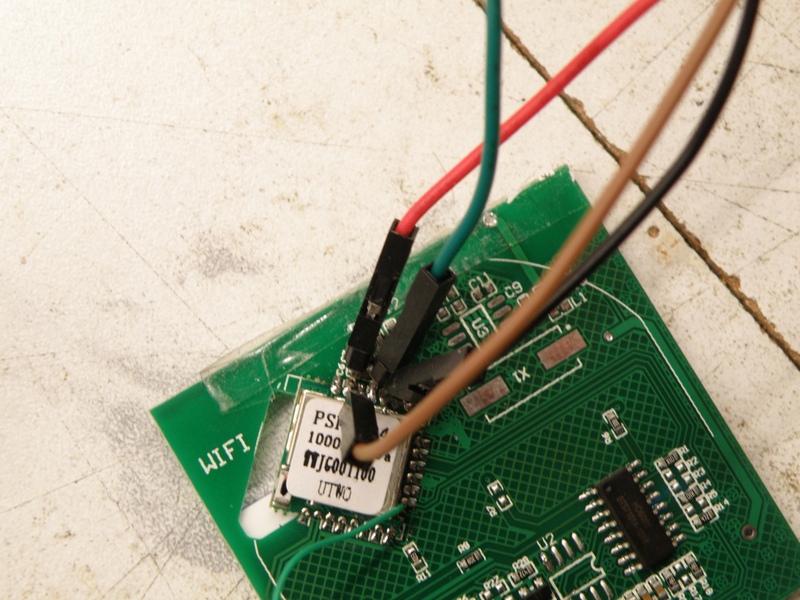 This time a hack on the EWelink wifi touch switch. The EWelink touch switch is a similar product as the Sonoff touch, but I find the look a bit nicer. It’s more streamlined and is also available with black front. The EWelink is sold in 1,2 and 3 gang version for the EU and US market. I had only the 2 gang EU version, but it looks to me that the 1,2 and 3 gang EU version are the same. They left some parts out, but the pcb’s are all the same. Can’t say anything about the US version, don’t have one to take apart. The hart of the EWelink touch switch is the PSF-B04 module. 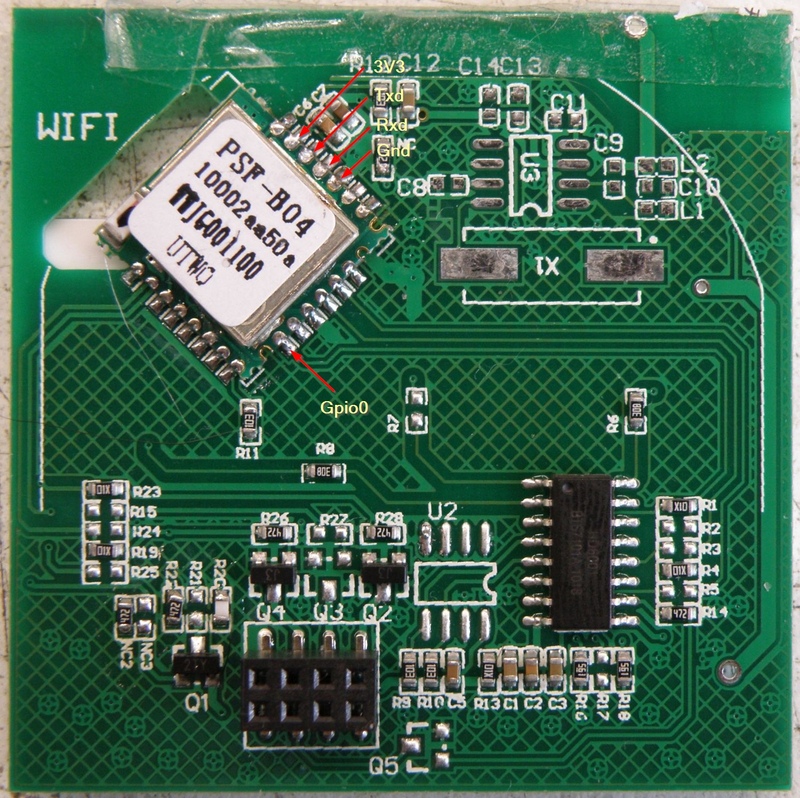 This module contains inside the well know ESP8285, that’s in fact an ESP8266 with build in 1M flash memory. Just like the hacks for the Sonoff products we need to connect Txd, Rxd, Vcc, Gnd and Gpio0 to the touch switch to make it possible to upload our own firmware. 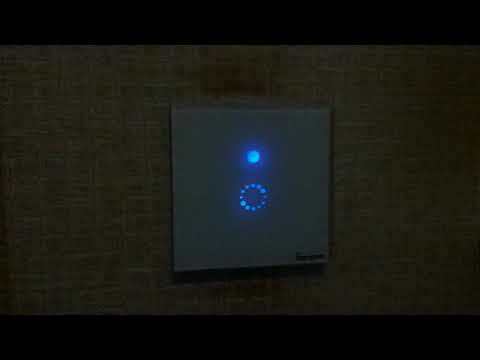 Bummer, EWelink didn’t provide us just like Sonoff with a header where most of the pins required are easy accessible. Time to get the soldering iron and solder some header pins direct to the PSF-B04 module. Because you can’t and won’t program the touch pcb when it’s connected to the power pcb, you need to provide it also with 3.3V power. For the Gpio0 a simple wire will do the trick to get the ESP8285 in programming mode. The 1 gang uses the middle touch sensor, the 2 gang uses the left and right touch sensor and the 3 gang uses them all. Note:It looks to me now that they place some resistors in other places for the 1,2 and 3 gang. Think they do that for example so touch1 is always connected to gpio0, but in the 1gang touch1 is in the middle and for the 2 gang the touch is at the left . Can’t verify this because I only have the 2 gang. Important Note: As you can see in the last picture below they have placed a screw between the fase (L) and neutral (N) to hold the power pcb in place. The screw makes the isolation distance between the L and N to narrow. The minimum isolation distance requirement for 230V~ is 2.5mm and preferable >3mm. With my Ewelink is was total 2.4mm, that’s not enough. Simple solution, remove the screw, it doesn’t do anything. The power pcb can’t move because of the screw terminals and the other screws. Do this all at your own risk. Just like in all other Sonoff products one of the leds is hardwired to the relay and will lit up when the relay is switched on. In my post over the Sonoff Wifi powerline switch mod I described how to put the led on a seperate IO pin of the Esp8266 so you can get full control over the led. 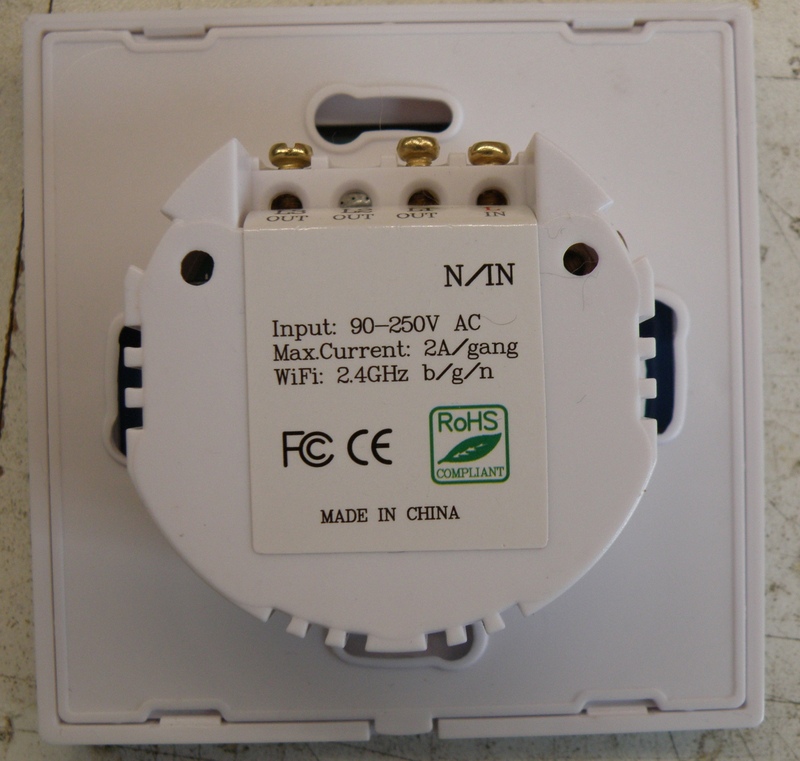 This post will do the same for the Sonoff touch led that’s behind the touch sensor. 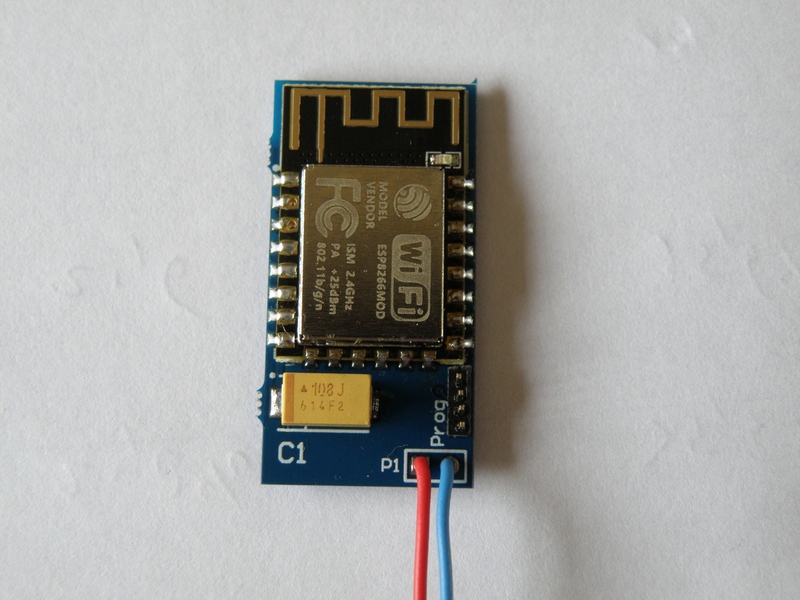 The Sonoff touch has an Psf-a85 module on board from Itead, this module has the esp8285 inside. 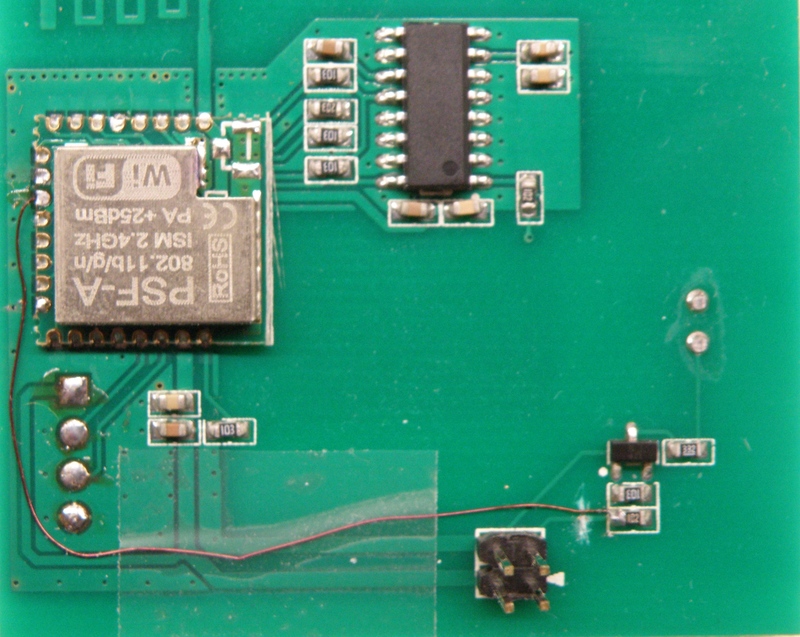 With the pinout and schematic available of the psf-a85 it’s easy to find the required pins. You need to scratch the pcb track that’s going to the 1K resistor (see picture below). After that you need solder a thin wire between the 1K resistor and one of the free IO pins on the psf-a module, in the picture I choose pin 3 IO4. 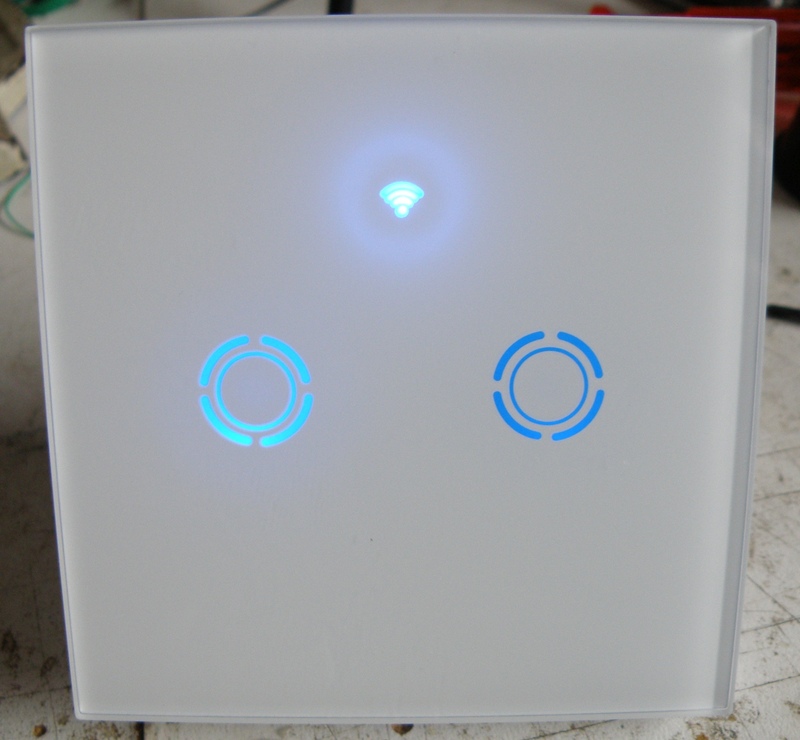 Now you have full control over both (wifi and touch) led. My idea was to let the touch led glow so you can find the touch button easy in the dark. 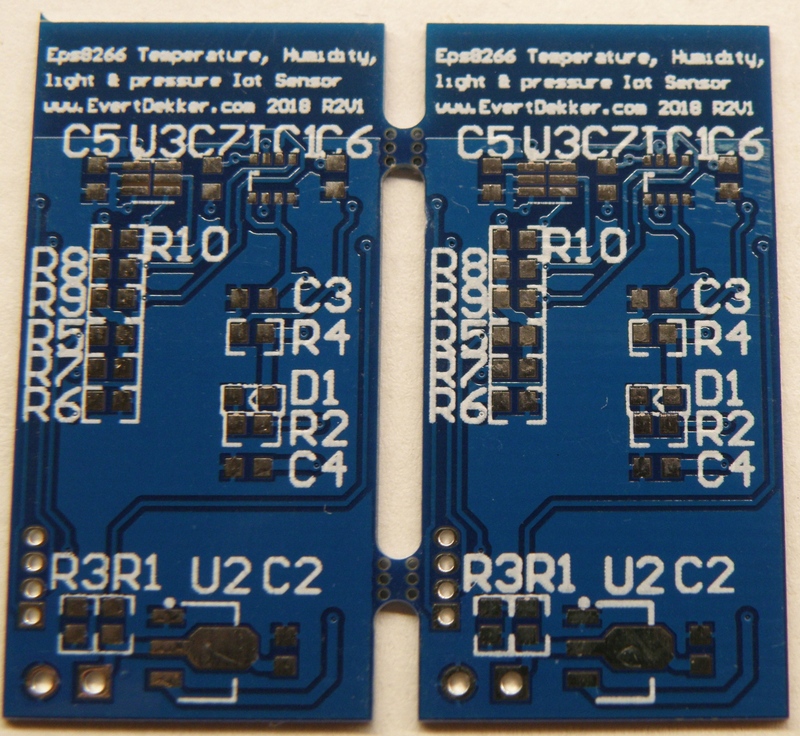 If you don’t know how to flash the esp8285 have a look at this. Personally I add to all my ESPxx programs the OTA (over the air) flash capability’s so you can remove the usb to serial convertor and close up the housing for safety purpose and flash new firmware ota.